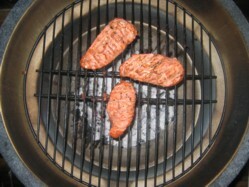 This BBQ tandoori chicken recipe was top of the agenda when I got the opportunity to cook on a kamado. The ceramic grill can heat up to the phenomenal temperatures that exactly mimic the traditional Indian clay oven called the tandoor so it sounded like a match made in heaven. If using thin chicken breastsyou can cook on the traditional grill but the challenge is always to get the grill up to temperature, just don’t be afraid of a little burnt pieces. The whole premise to tandoori cooking is high temperature and the marinade forms a crust so that the meat remains moist inside. So if there’s a little blackening on the outside, well, what the hell, that's the way it's supposed to be. So you can do this BBQ tandoori chicken recipe on a high temperature grill, but in my opinion it’s just not as good. If you can, invest in a ceramic barbecue – if you’re into Indian food you won’t regret it, in fact, when you’ve done chicken tikka too, you’ll wonder what took you so long to decide! The other piece of equipment that you’re going to need for this recipe is a food processor. There’s loads in this marinade so don’t be afraid to marinade a few breasts extra and freeze them for a later cookout. Note:- This marinade is yogurt based and works differently to other acid / enzyme based marinades so this style is best used overnight. Read my section on barbecue marinades to better understand this point. Check the food colouring labels because who knows what might be in there! Remove any skin from the chicken breasts, squeeze the lemon juice over and rub in the salt and pepper. Place the chicken in a flat non metallic marinating bowl. Chop the onion, garlic, ginger and throw them into the food processor, pour in the yogurt and vinegar and give it a good blitz. Add the remaining ingredients and give it another wizz. Pour the mix over the chicken making sure that everything is covered and then leave for a minimum of 8 hours (preferably overnight) in the refrigerator. Remove the marinade from the refrigerator a couple of hours before you plan to start cooking, that way you'll get the chicken breasts back up to room temperature and they'll cook through more evenly. Extract the chicken breasts from the marinade, scrape off an excess and then pat dry on kitchen towel. This will ensure that the chicken breast crisps on the outside, if there's too much of the yogurt still on the chicken you'll just get a soggy mush. For cooking on the kamado, cook over direct heat with the lid closed at approx 250°C or 475°F for 15 minutes turning the chicken once. (Note that the timing may need to be altered depending on the thickness of the chicken breast). Using an instant read thermometer you need to be looking for 75°C or 170°F to ensure that they are cooked though. When you've hit the core temperature, take your bbq tandoori chicken breasts off the heat and allow them to rest for 10 minutes prior to serving. Serve your BBQ tandoori chicken breasts in thick slices over shredded iceberg lettuce, tomato and cucumber slices and a wedge of lemon. Perhaps a little cucumber raita to finish off?